A brand new saga of magic and adventure by #1 New York Times best-selling author Brandon Sanderson. On the planet of Taldain, the legendary Sand Masters harness arcane powers to manipulate sand in spectacular ways. But when they are slaughtered in a sinister conspiracy, the weakest of their number, Kenton, believes himself to be the only survivor. With enemies closing in on all sides, Kenton forges an unlikely partnership with Khriss -- a mysterious Darksider who hides secrets of her own. White Sand brings to life a crucial, unpublished part of Brandon Sanderson’s sprawling Cosmere universe. The story has been adapted by Rik Hoskin (Mercy Thompson), with art by Julius Gopez and colors by Ross Campbell. 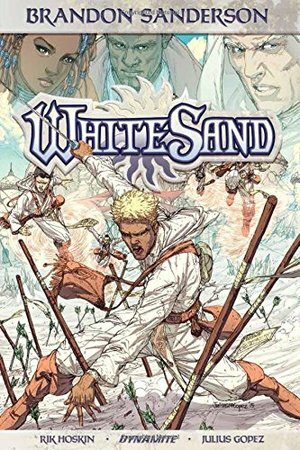 Employing powerful imagery and Sanderson’s celebrated approach to magical systems, White Sand is a spectacular new saga for lovers of fantasy and adventure.